Josh Reynolds understands the difference between chasing his dreams and acquiring them. He has just recently started reaping the fruits of the many seeds he sowed during his collegiate career. 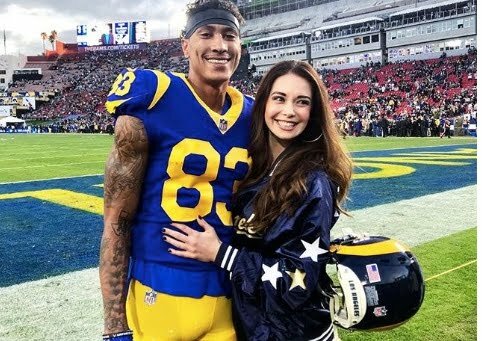 Irrespective of the fact that he was one of the topnotch during his days in college who attracted teams from the big league (NFL), he stayed put in school, graduated and finally joined the league in 2017 after he was selected by the Los Angeles Rams in the 2017 National Football League draft. Today, he joined the team to the Superbowl competition in 2019 and starred in his position irrespective of the fact that his team lost to the New England Patriots. Apart from excelling in his career, he has been bitten by love and has remained faithful to his longtime girlfriend. Read on to find out more about his personal life, rise to fame and other fascinating facts. Josh Reynolds was born into a sporting family, however, there are not many details known about them especially his mother bu6t on the other hand, his father, Michele Reynolds, is known to be a lover of sports. The wide receiver was born on the 16th of February, 1995 in San Antonio, Texas. He is an American and is of white heritage. He started his journey to building a footballer career as a student of John Jay High School where he played as a wide receiver and a safety. In his senior year, he totaled 44 catches for 667 yards and 48 tackles with 3 interceptions. By the time high school days were over, his records showed that he amassed a total of 102 receptions for 1859 yards on 22 touchdowns. He received a lot of athletic scholarship offers but settled for Tyler Junior College. Also, he was rated as a three-star recruit. Josh spent only a year in the college before transferring to Texas A&M in 2014, there, he joined the football team and broke a school record in his first year for most touchdowns in a single season as he recorded 13 touchdowns from 52 passes for 842 yards. Despite having been attracted to most of the teams in the big league (National Football League), the footballer chose to complete his studies before going pro. Josh Reynolds became a professional footballer after he was selected by the Los Angeles Rams in the 2017 NFL draft. He was selected as the 117th overall pick and made his professional debut game the following season recording 11 catches for 104 yards and 1 touchdown. In a rumble tumble with the Dallas boys and New Orleans Saints, the footballer contributed to his team’s wins with a record 29 catches for 402 yards with 5 touchdowns during the games. During the 2019 Superbowl game, the Los Angeles Rams lost to the New England Patriots who claimed the trophy. When love bees sting, it is as beautiful as most of the love fairy tales with happy endings. Josh Reynolds fell in love with a sports reporter who is based in Los Angeles, Haley Graves. Reports say that the duo has known themselves for a very long time and has been an item since their days at Texas A&M University. Haley on her part is knowledgable with the events that take place in her boo’s career as she works as a sideline reporter for AggieFBLife on YouTube. She has gone ahead to interview a lot of student-athletes including Josh who she asked a lot of questions in 2015 during one of her numerous interviews. Before joining the press team in Texas A&M University, she was a cheerleader from 2012-2014. She graduated from the university in December 2016 and landed a job with Dance Showcase USA. Subsequently, she worked as a part-time reporter for the Ventura County Star and is currently a reporter for Fox Sports. In addition to her journalism career, she also plays as a model. The reporter was born sometime in February 1994 and was a student at New Braunfels High School. Born as the first son of his parents, Josh Reynolds has a younger brother named Moses who has also taken the path of an athlete. He was born three years after his older brother precisely on October 13, 1997. Moses attended John Jay High School where he played various positions offensively and defensively in the game of football. He is rated as a three-star recruit by Rival.com and currently plays as a safety for the Texas A&M Aggies. Working hard on the field is best achieved with the rigorous plenty of practices and workout behind the scene. Most athletes have developed loyalty to the consciousness of their build and maintain a healthy food habit. Josh Reynolds has no exceptions when it comes to his body physique. He stands at 6 feet 3.5 inches and weighs 88 kg. He has a hand size of 9 inches and a vertical jump height of 37 inches.